12 The next morning as they were leaving Bethany, Jesus was hungry. 13 He noticed a fig tree in full leaf a little way off, so he went over to see if he could find any figs. But there were only leaves because it was too early in the season for fruit. 14 Then Jesus said to the tree, “May no one ever eat your fruit again!” And the disciples heard him say it. 19 That evening Jesus and the disciples left the city. Cursing the fig tree can seem like such a weird, random act, one out of character for Jesus. When something seems odd in Scripture, we need to figure out whether something else is going on or if we need to rethink our understanding of Jesus. In this case, the fig tree story is told in two halves, first the cursing and then the discovering of the withered tree. These halves serve as bookends, framing the key story of the Temple clearing. Key because Jesus seems to take ownership of the Temple (My house!) and because his actions there precipitate his execution. The religious leaders had been unhappy with all the attention Jesus was getting with his miracles, healings, and authoritative teaching. 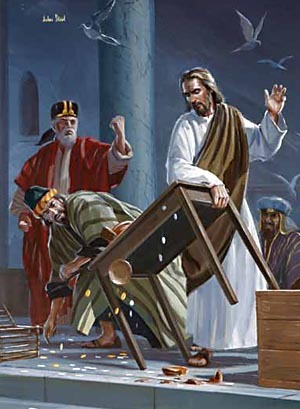 But here he goes too far for them, upsetting the Temple economy (at a very busy time of year) and threatening to draw unwanted attention from their Roman overlords. The only solution for them is that Jesus must die. So much is the political intrigue in this passage, but the fig tree story helps us see beyond that. The religious leaders had decided that Jesus had to go, but more importantly, Jesus had decided that their pseudo-worship was devoid of faith and would never produce fruit. Note carefully Jesus’ response to the disciples’ discovery of the withered tree. If you believe in God – if you believe to the point that you forgive others and live in the vulnerability that entails, trusting God with all things – then your sins are forgiven and your prayers are answered. No need to bring sacrifices, no need to buy the approval of (too often greedy) religious leaders. The way of Jesus produces fruit. Specifically, the fruit of the Spirit: love, joy, peace, patience, kindness, goodness, gentleness, and self control. Expressions of religion that do not produce these fruits are cursed and will wither. Even ones that use Jesus’ name.